Looking for a spooky movie to watch around Halloween? 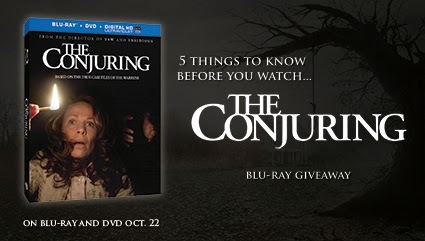 Check out the October 22nd release of The Conjuring on Blu-ray and DVD. This will surely be a hair raiser. Don't miss the giveaway below, too. Our giveaway here runs through Halloween. 11:59pm EDT on 10/31/13 and is open to 18+ readers from the US and Canada. 2. If it is that scary it must be good! My favorite freaky fact is #3 - the crew experience creepy events while filming. 5. That is creepy! I would be jumping out of my skin! My favorite freaky fact: The Conjuring’s cast and crew experienced creepy events during filming. Very creepy! #3 The Conjuring’s cast and crew experienced creepy events during filming. The Conjuring’s cast and crew experienced creepy events during filming. Scratches appeared out of nowhere on Vera Farmiga’s computer soon after she agreed to act in the movie, the crew were routinely woken by something in the “witching hour” between 3 and 4AM, and the real-life Carolyn Perron fell and broke her hip while visiting the set. I really like #3, that is soooo creepy! #4-- The Rhode Island farmhouse where The Conjuring is set once belonged to an accused witch, Bathsheba, who tried to sacrifice her children to the devil and killed herself in 1863. #5 because I've seen it and totally didn't see the hands- I have to watch it again!! %4 The Rhode Island farmhouse where The Conjuring is set once belonged to an accused witch, Bathsheba, who tried to sacrifice her children to the devil and killed herself in 1863.
the ghostly clapping hands throughout the movie, SCARY!! I find this fact very interesting about the movie; 4) The Rhode Island farmhouse where The Conjuring is set once belonged to an accused witch, Bathsheba, who tried to sacrifice her children to the devil and killed herself in 1863. Hold your applause! The Conjuring will make you terrified to clap! Whether it’s playing a traditional game of hide-and-seek by following the clapping sounds like the mother and daughter in the movie, or being terrorized by ghostly claps in different rooms of the haunted farmhouse, these claps throughout the movie will give you the creeps! I like fact number four. Myself and my son love to watch things on tv about these kinds of events. #4 is pretty darn freaky....they all are. My favorite is #4 The Rhode Island farmhouse where The Conjuring is set once belonged to an accused witch, Bathsheba, who tried to sacrifice her children to the devil and killed herself in 1863. #4 Rhode Island farmhouse where The Conjuring is set once belonged to an accused witch, Bathsheba, who tried to sacrifice her children to the devil and killed herself in 1863. The Rhode Island farmhouse where The Conjuring is set once belonged to an accused witch, Bathsheba, who tried to sacrifice her children to the devil and killed herself in 1863. The Conjuring’s cast and crew experienced creepy events during filming. I like that they expierenced strange things while filming. I liked 4) The Rhode Island farmhouse where The Conjuring is set once belonged to an accused witch, Bathsheba, who tried to sacrifice her children to the devil and killed herself in 1863, it's a cool fact.